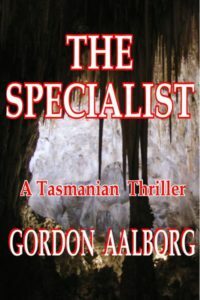 1st in the “Specialist” series of Tasmanian thrillers. The Specialist is a serial killer with very specific and unique tastes. He especially likes the flavor of innocent female bicycle tourists. Kirsten is a jewellery designer whose hobby is caving, and she carries a lot of emotional baggage, above-ground or in the bowels of the earth. Her sister Emma goes missing en route to visit Kirsten, then her sister’s Kirsten-designed ring mysteriously turns up in a newly discovered cave on Vancouver Island. This cannot be and should not be, but Kirsten knows it to be true because she found the ring herself! Now she has to solve the riddle of an apparent impossibility, with the help of a few old friends and one deliciously tempting new one. The specialist wants her to join him for dinner. He’s good, and he moves too damned well to suit me, but he’s no caver. And he doesn’t know this cave; I do. The other exit. He doesn’t know about that! Her spirits sang, until she remembered the tightness of the crawl to get there, the devil’s club with its fierce, unrelenting spines. But at least it was a chance, and a good one…if she was lucky, if she was fast enough, tricky enough! Then she heard the voice…that beautifully-modulated, rich, chocolate-fudge voice, amplified by the underground, the more beautiful for that…and all the more frightening, too. She didn’t answer, kept her attention on the tiny flicker of light, knowing it wasn’t as far back in the passage as it looked, knowing she would have to move, soon, and move quickly. Knowing, too, that once the doctor got close enough, he had only to follow her own light, and if he could maintain her speed it would be impossible to lose him. She would have to pause, look back, if she wanted to know where he was, how close he was. He would be advantaged by not having to pause in his pursuit. Lee Child, author of the “Jack Reacher” series.